The court determined that the accused Seminole Heights murderer, Howell Emanuel Donaldson III, was competent to stand trial just recently. In Florida, the standard for determining if a defendant is competent to stand trial is whether or not the defendant understands the charges against him and can participate in his own defense. The court ruled that Donaldson had both the capacity to understand the charges for which he is being tried and the ability to participate in his defense. Although Donaldson is competent to stand trial, the defense may still pursue a diminished capacity or insanity defense. That, of course, depends on the quality of evidence against Donaldson. The police have two pieces of evidence tying Donaldson to the attacks. The first is a .40-caliber Glock found in his possession and the second is data from his cell phone that indicated that he was in the area at the time of three of the shootings. Each of the victims was shot with a .40-caliber Glock, but prosecutors will need to show that particular Glock was used in each of the shootings. Typically, guns leave specific signatures on the bullets that are discharged. These are as unique as a fingerprint. Now that the police have the weapon, they can run a forensic analysis on it to determine if that gun fired the bullets found at the crime scenes. In cases in which the prosecution introduces complex forensic science, there is always the chance that they’re forcing the evidence to fit their theory. Tying that specific weapon to those specific crimes is as close to a smoking gun as the prosecution ever gets. Scientifically speaking, forensic scientists fire the gun into a water tank and then test the markings on the bullet against those found at the crime scene. If the markings on the bullet match then it is assumed that the bullets were fired by the same gun. Essentially, the jury and the rest of humanity takes it on faith that this method is accurate and produces consistent results. When the state brings in evidence such as this, the defense is forced into the position of bringing an expert witness to either debunk the science or contradict the finding. In either case, it becomes an expense to the defendant. Donaldson, who is being represented by public defenders, may not have access to the funding necessary to call an expert witness to contradict the state’s forensic scientists. In that case, it becomes a matter, as often it does, of who throws around the most money at the trial. In the event that the forensic evidence comes back a match for the gun, then the defense may be left with either pleading for life without the possibility of parole or arguing diminished capacity (ie: insanity). Insanity defenses are quite rare in actual criminal trials though they are popular in fictionalized crime drama. When a defendant pleads insanity they are not allowed to walk out of court and go about their business. They are referred to psychiatric hospitals that specialize in forensic patients. Still, if treatment helps Donaldson, he may be able to walk free. If you have been accused of a crime, the West Palm Beach criminal defense attorneys at the office of Scott Skier can help. 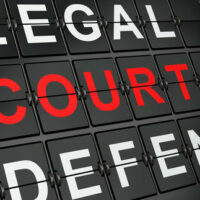 Give us a call at (561) 820-1508 or contact us online, and we can begin preparing your defense immediately.